We are entering our third day of snow flurries and sub-freezing weather. 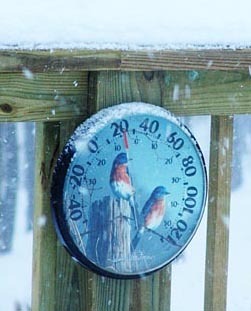 About 8 inches of snow have accumulated and the temperature has hovered in the low twenties most of the time. We have not left the house since Friday night when it started snowing after our night out with other Floyd bloggers. We prepared for this storm by stocking up on food and firewood. I even managed to move the emergency generator next to the side porch where I can get at it easily if the power goes out. In the main areas of the house, we have a new hardwood floor that makes life much more comfortable and most of the construction debris has been removed. We no longer feel like we are roughing it, even though there is more to be done. We have used these last few days of enforced isolation to unpack more moving cartons. We now have two office areas with fully operational computer systems so we are beginning to see a return to a fully functional working and living area. The open plan of the main area gives us more available living space than in the larger home we left at Lake Monticello, VA. The fact that it is still littered with lumber and contractor tools doesn’t lessen its essential charm. Our family and friends have been concerned that we were taking a big chance using a wood stove as the main source of heat. We seem to be all right because the stove has kept the house temperature in the mid to high seventies during the last few days of 18-20 degree weather. 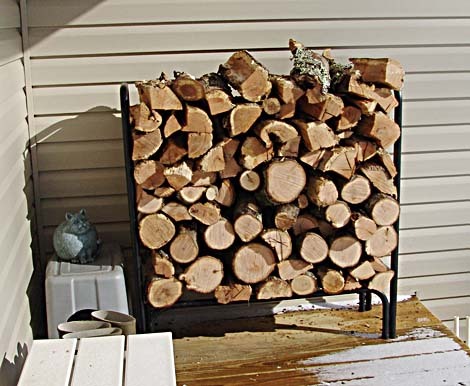 We were surprised at how much wood we burn since we have no recent experience using wood stoves, so we took Fred First’s advice and made plans to set up several firewood storage areas that would be accessible in time of winter snow storms. 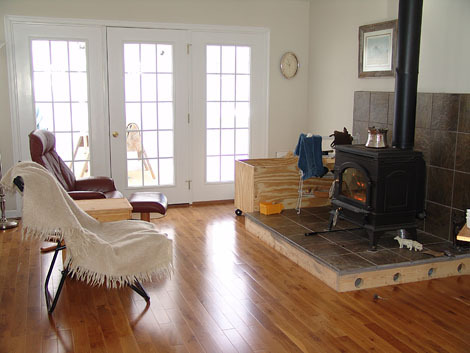 I have a large (2’x2’x4′) rolling wood box next to the hearth which holds firewood for a day. 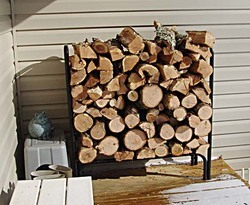 I set up this wood storage rack on the porch and it holds enough firewood for another three days. If we are snowbound for more than four days, I will have to restock these convenient storage areas with wood from the woodpiles next to the workshop. That will necessitate digging out a path and removing tarps, so I will wait until the sun is out and the temperature warms up a bit. We have one four wheel drive vehicle, the Subaru Forester, which allows us to drive in to town whenever we need more provisions or company so we are only as isolated as we choose to be. When I get my new office area fully set up today I plan on taking a break and celebrate by taking Gretchen into town for a latte at Cafe Del Sol and a round of errands. We might even get a chance to take some pictures. Hope you are all making the best of this storm. Sherman thinks it’s the absolute pits. You can see from his body language that he is thinking, "Yuck!" Same thing here. All of the big furniture is in place except the new king size, or should I say dog size bed, which will be here in another week so I got lots of boxes unpacked. Getting the hang of keeping a good blaze going in the fireplace and mine also puts out lots of heat and the house seems to be very well insulated. The cat has chosen to become an indoor only girl, at least until spring arrives, the young dog gets a serious case of the zoomies each time she goes out in the snow and the older dogs also seem to enjoy it for a short time then want in out of the cold. Life is good here in Floyd. Hey David, great progress on the house! Don’t forget to invite this Boones Mill blogger over to your housewarming party 😉 I like the rich and variable stain on the floor. It complements the tile. What are you going to be trimming the riser with? I took some photos while doing horse chores the morning after the snowstorm and posted many of them on my blog. It was a really special morning! The place looks great! Nice to hear that you are getting settled. Very cool post. It portrays a spirit of homesteader-self-reliance. 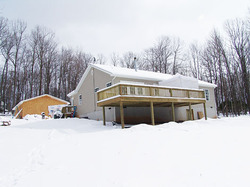 I sense a feeling of adventure as you go through your first major snow in your new home. Very exciting and very cool. That looks a lot like my house. I really enjoyed our visit this morning, neighbor.